Third place after Liberty and Lincoln of Edwardsville. Lucas Herrmann and Sarah Rose were in the Top Ten! We were first in small school! Scores coming…Congrats Team Lucas Herrmann, Sarah Rose, Mary Wessel, Spencer Biske and Mrs. Weiler! SLU HIGH MATH CONTEST Jack Sainz took third to anchor the team and we were SECOND OVER ALL! CONGRATULATIONS TO Coach Karen Weiler and Team members jack Sainz, Johnny Adams, Adam Stearns, Ben Traxler, and Robbie Guetterman! 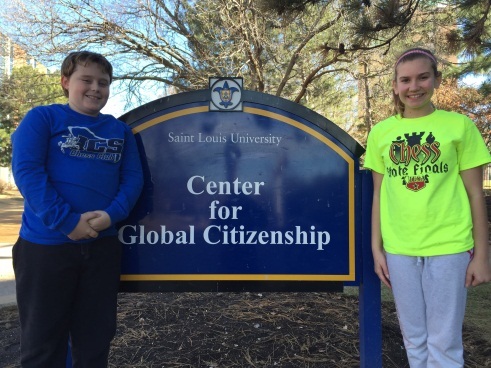 held Saturday, February 7th at The Center for Global Citizenship at St. Louis University. ICS sixth graders faced fierce competition at the junior high and high school level with 263 students competing from various public and private schools throughout the St. Louis area.